More than a dozen senior Christian, Jewish and Muslim leaders from the Holy land have concluded an unprecedented joint declaration pledging themselves to work together for a just and lasting peace. 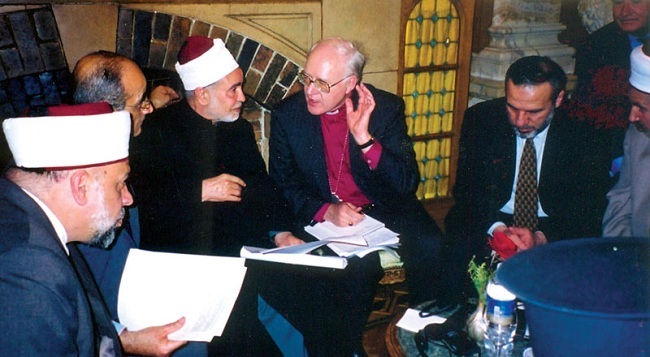 The agreement, to be known as the First Alexandria Declaration of the Religious leaders of the Holy Land, was approved Monday, January 21, at a landmark conference of religious leaders in the Egyptian port city, chaired by the Archbishop of Canterbury, Dr. George Carey. The seven-point declaration pledges the faith leaders to use their religious and moral authority to work for an end to violence and the resumption of the peace process. It also envisages the establishment of a permanent committee of leaders from three religions in the Holy Land, to pursue the implementation of the declaration. The accord also calls on Israeli and Palestinian political leaders to implement the Mitchell and Tenet recommendations. The conference, which began on Sunday, is the first occasion on which such senior figures from the three religions have held discussions in such a focused way. It is being co-hosted by the Grand Imam of al-Azhar al-Sharif, Dr. Mohamed Sayed Tantawi, the most senior Islamic figure in Egypt and holder of one of the most prestigious positions among Sunni Muslims.